What is the threshold between being alive and not, between a matter body or vibrational body. Which kind of ritual we can adopt to celebrate the end of life and through which kind of sharing? The series Nativity Scene is the outcome of a major grief that struck the artistic community I work with for years. I celebrated the abandonment thanks to the reenactment of the classical and Renaissance representations, fitting in the classic icons through a queer attitude. 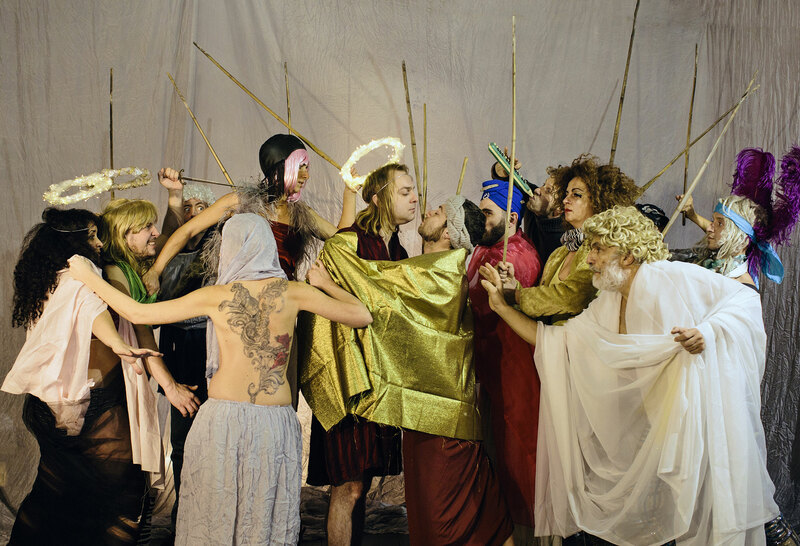 The Nativity Scene retrace the steps of a life embodying by a collective body, from birth to treason, investigating the threshold between absence and presence. Qual’è la soglia fra essere e non, fra corpo di materia e vibrazione, come si celebra una morte, attraverso quali ritualità, attraversando quale condivisione? La serie Nativity Scene nasce a seguito di un importante lutto che ha colpito la comunità artistica con cui collaboro da anni. Ho celebrato l’abbandono attraverso il reenactment di opere classiche e rinascimentali, calando nelle raffigurazioni classiche attraverso un’attitudine queer. Nativity Scene ripercorre le tappe di una vita, incarnata da un corpo collettivo, dalla nascita al tradimento, investigando la soglia fra assenza e presenza.